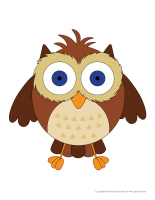 Have a hoot with this theme's workshops, outdoor activities, games, and craft suggestions. Owl-themed coloring pages, activity sheets, decorations, word flashcards, masks, puppets, and so much more! 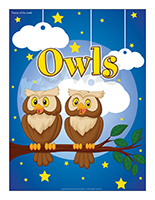 (Open thematic poster-Owls) Print, laminate, and display all kinds of posters. 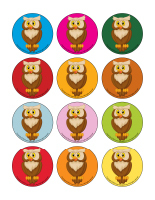 (Open educa-theme-Owls) Print and laminate the items that represent the theme. Use them to present your theme to your group (and parents) while decorating a corner of your daycare. 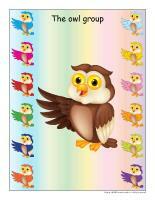 (Open educa-decorate-Owls) Print, laminate, and cut out the various items. Use them to decorate your daycare and set the mood for the theme. (Open garland-Owls) Print the models. Let children decorate them. Cut them out and hang them within your daycare or near your daycare entrance to create a garland. 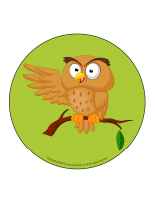 (Open stickers-Owls) Print the document on adhesive paper. Cut around each illustration and use them as stickers for crafts and rewards. 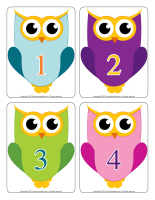 (Open educa-numbers-Owls) Print and laminate the posters. Display them on a wall to decorate your daycare throughout the theme. (Open educa-letters-Owls) Print and laminate the posters. Display them on a wall to decorate your daycare throughout the theme. (Open group identification-Owls) This tool was created in response to a special request received. Print and laminate the various cards and posters and use them to identify children's spots and belongings. 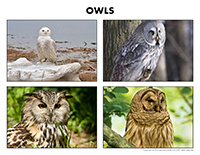 (Open picture game-Owls) Print and laminate the pictures in the format you prefer. Use the pictures to spark a conversation with your group. Ask them questions about owls. (Open Poni discovers and presents-Owls) Print and laminate the posters. Use a Poni puppet (or another puppet children are familiar with) to present the pictures to your group. The pictures may be used as a memory game or to spark a conversation with your group. Use them to decorate your daycare or a specific thematic corner. 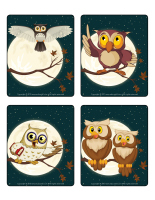 (Open picture game-Owls) Print, laminate, and store the pictures in a Ziploc bag or in your thematic bin. 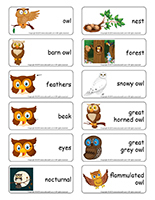 (Open activity sheets-Owls) Activity sheets are suggested for each theme. Print and follow instructions. 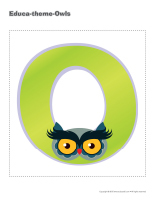 (Open writing activities-O like owl) Print for each child or laminate for use with a dry-erase marker. 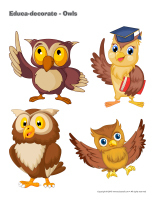 (Open educa-nuudles-Owls) Print for each child. Have children color the sheet and use Magic Nuudles to give it a three-dimensional look. Variation: You don't have Magic Nuudles? Have children fill the spaces designed for Magic Nuudles with bingo markers or stickers. To order Magic Nuudle. Provide wooden sticks (Popsicle sticks, skewers, etc.) children can use to build unique structures. Cardboard, tissue paper, empty egg cartons, recycled materials, etc. that can be used to create a cabin in the woods. Hang a large piece of paper on a wall to create a mural as a group. If you wish, draw a few trees and let children add leaves, animals, owls, etc. Simple tree designs. Children can glue leaves on the branches and stick brown construction paper on the tree trunk. Add owls on the branches too. Encourage children to use glue sticks since white glue may soak through the paper. An easel (or paper hung on a wall), a large piece of paper, and poster paint. Children can paint a forest and owls. Popsicle sticks and white glue can be used to build a cabin in the woods. What tracks do different types of animals leave behind? Children can step in paint and then on paper to make prints. Help them notice how no two set of prints are the same. Coloring pages related to forest animal, nature, and owl themes. 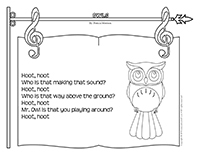 Children can draw owls while listening to a recording of nature sounds. o	Provide a picnic basket filled with plastic dishes and food items, a blanket, a radio with a sounds of nature CD, etc. Children will love pretending to eat a picnic in the forest. This activity can also be done at lunch time. Simply set a blanket on the floor in the centre of your daycare and serve lunch to your group. o	A tent, two sleeping bags, utensils, dishes, plastic food items, pyjamas, etc. No matter which theme you pick for your role play area, decorate using giant paper trees, forest scenes from old calendars, fabric leaves, etc. Transform your role play area to represent a forest and add paper or stuffed owls. Memory game related to the owl theme. Brown and beige modeling dough children can use to shape owls. Leave their creations out to dry. Use yellow, orange, and red modeling dough to create an autumn forest scene and add children's owls among the trees. A felt board with forest animal, tree, and owl shapes. Memory game where children must associate animals to the correct habitat. A variety of objects from nature. Encourage children to observe them. Association game involving animals with fur and animals with feathers. Books about animals that live in the forest. CDs with nature sounds, birds singing, and animal sounds with a headset. Forest animal, bird, and owl puppets. An obstacle course throughout which children must move like various forest animals. An obstacle course throughout which children must search for pictures of owls. A large container filled with soil. A container filled with fall leaves (real or fabric). Fill a large container with leaves, bark, coniferous branches, and pinecones. Let children manipulate and observe the items with magnifying glasses. Deposit different types of mushrooms in clear containers and encourage children to observe them. Provide raffia, hay, and pieces of yarn children can use to make bird nests. A vivarium containing insects. Don't forget to cover it with a lid. Plant flowers, various plants, etc. (Open game-This is my spot-Owls) Print two copies of each illustration. Use adhesive paper to stick one copy of each illustration on the table. Place the second copy in a bag. Children take turns picking an illustration to determine where they must sit at the table. You may also use the illustrations to determine children's naptime spots or their place in the task train. 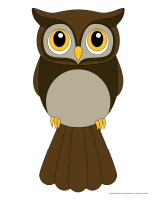 (Open my owl path) Print, laminate, and secure the illustrations on the floor of your daycare to create a path leading to the areas frequently visited by children throughout the day. The path can lead to the bathroom, the cloakroom, etc. If you prefer, use the illustrations to delimit various areas. Use colourful adhesive tape to draw a start and finish line. Deposit two leaves (real or fabric) approximately 10 cm apart. Provide a drinking straw or empty toilet paper roll children can blow in to make their leaf move forward. The first child who successfully crosses his leaf over the finish line wins. Variation: If you wish, set a few obstacles between the start and finish line to make the activity more difficult (chairs, tables, bowling pins, etc.). Pick a child who will be the owl. The owl must chase the other children until he/she catches one. The child who is touched becomes the owl for the next round. Variation: When the owl touches a child, the child who is touched must stand perfectly still and stretch his/her arms out to the side. Another child can free him/her by running under one of his/her arms. Several children can have their arms stretched out at the same time. You will have to change owls frequently because children will get tired quickly. With your group, walk like an owl. One child is the owl. He/she must try to catch the other children. Every time the owl catches a child, he/she can tickle him/her. The tickled child becomes the owl for the next round. To begin the game, select a child who will be the barn owl. He/she curls up in a ball under your parachute. Another child, who will be the owl, stands on top of the parachute. The other children hold the edge of the parachute and move it up and down to help the barn owl escape. Once the owl catches the barn owl, he/she becomes the barn owl for the next round and another child becomes the owl. Collect items that are available in nature when you are out for a walk in a nearby forest or simply in your neighbourhood with your group. Upon your return, hang a large piece of paper on a wall. Encourage children to glue the items they collected on the paper to create a mural. Go for a magical walk in your neighbourhood. Invite children to pretend they are walking in the forest like the Little Red Riding Hood. Encourage them to identify as many red items as possible. 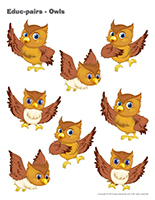 (Open educ-trace-Owls) Print for each child. Children must trace the lines using a crayon of the corresponding color and then color the object at the end of each line using the same color. (Open educ-pairs-Owls) Print. Children must draw a line to connect matching items or color them using the same color. For durable, eco-friendly use, laminate for use with a dry-erase marker. (Open color by number-Owls) Print for each child. Children must color the picture according to the color code. Children love building cabins and playing in them. Drape a few old bedsheets over your furniture, tables, and chairs to create tents or cabins. Add items that can be found in the forest and pictures of owls. Encourage children to spend time in these homemade cabins. You can even choose to let them eat their snack in them. (Open mandalas-Owls) Print for each child. Ask children to color the mandalas to help them calm down throughout the day. (Open models-Owls) Print the models and use them for your crafts and activities throughout the theme. (Open clock-Owl) Print and cut out the pieces. Give each child a paper plate and have them glue the numbers all the way around it, making sure the "12" is at the top and the "6" is at the bottom. Cut the two hands. Make a hole in the centre and insert a fastener to hold both hands in place. Glue the owl parts on the plate to make it look like an owl. The plate will represent the owl's stomach. 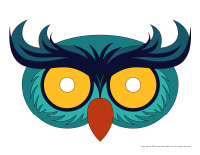 (Open educa-decorate-Owls) Print and cut out. Glue the items on an old hat or on a strip of construction paper that can be used to form a headband. (Open craft-Owl) Print the owl parts and have children glue them on a piece of construction paper before cutting them out. Use fasteners to assemble them so the owl can move its head, wings, and feet. (Open puppets-Owls) Print and cut out. Stick a Popsicle stick behind each owl to create puppets. (Open masks-Owls) Print for each child. Provide crayons, glue, and glitter. Encourage children to decorate their mask as they wish. Give each child a paper plate in which you have already cut two holes out for the eyes. Using scissors and glue, children can add eyes, a beak, and feathers. When they are done, use a hole-punch to make a hole on either side of each child's mask and thread a piece of string through each one so you can tie their mask behind their head. (Open craft-My miniature owl) Print for each child. Ask children to color the owl pieces before gluing them on an empty toilet paper roll. (Open coloring pages theme-Owls) Print. Who is that making that sound? Who is that way above the ground? Mr. Owl is that you playing around?